So it was about 18°F outside yesterday and today. In general its been cold and yucky outside and I have limited daylight time to take photos due to my 9-5. 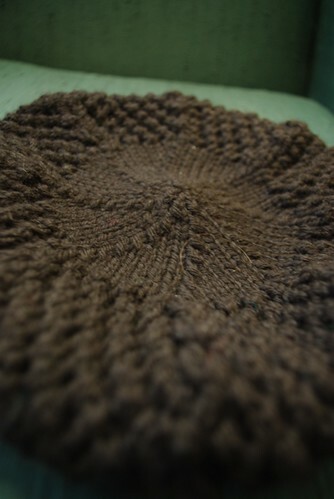 This is my excuse as to why I haven't posted about 5 finished knitting projects - no chance to take decent pictures. That and two of them were Christmas presents and I didn't want to spoil the surprise on the off-chance their recipents checked the blog. Well, the photos aren't super great and I'm still missing the sweater I finished in early November, but here's a quick roundup of some knitting I've done this winter. I call this my "Fisherman's Wife Beret." It's a fairly simple lace beret and I wear it all the time. I'm working on writing the pattern on it, which I'l let ya'll know about when I finish it. These were my first go at toe-up. 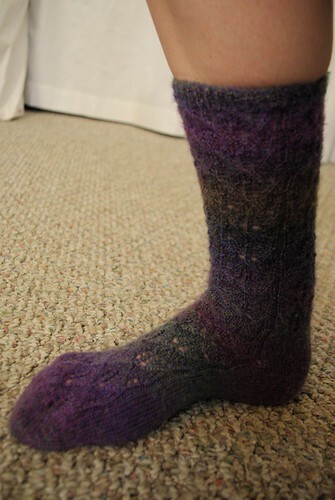 The pattern is Elfine's Socks and I found it to be very well written and I particularly liked the way the heel was done. I used the magic cast on from knitty for the toe - but I need to find a good cast off as I had to use a mechanical pencil to get the top loose enough! The yarn is Jojoland Melody Superwash - the color is great, but the yarn itself I wouldn't use again. This one was for my mom for Christmas. 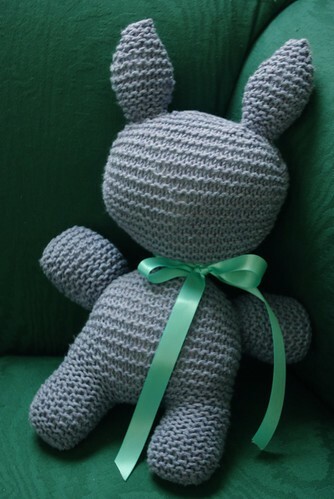 It's a bunny variation of my own pattern. 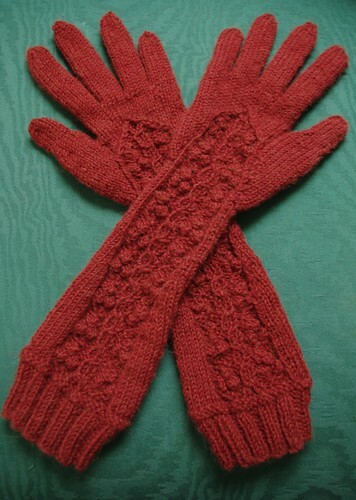 And this is the piece de resistance of my Christmas knitting, the "Winterberry Gloves," for my friend Kasey. I designed them from scratch having never knitted a glove before and they turned out really well. I'm making myself a pair with a few tweaks and am writing up the pattern for this one as well, which I hope to get out in February. Winter in Maine is good for knitting, what can I say?